Located only 125 kms (78 mi) from Toronto, the region of Peterborough and the Kawarthas is a tourist destination par excellence. Peterborough, a city of some 120,000 is known as the gateway to and is in the heart of the Kawarthas region, a wide-spread cottage countryside and large recreational area in Ontario that draws tourists year-round. From fishing, canoeing, biking and hiking, to skiing, hunting, and other summer and winter sports, this part of the province offers tourists things to do galore. It contains within its boundaries numerous attractions such as Indigenous Peoples’ historical landmarks and cultural heritage sites and activities, theatres, shopping, museums, fine-dining, farmers’ markets selling organic products whether straight from the land or baked from the oven, and an array of things to see and do. What defines the physical and cultural landscape of this part of south-central Ontario are the Kawartha Lakes and other waterways that crisscross the region. So beautiful is the area that the Ojibwa gave it the name kawartha meaning ‘land of shining waters’. There has been a large influx of the sons and daughters of Peterborough’s original inhabitants who have returned to the city and to the Kawarthas to make the area bloom. Their love of the land and what it can produce has drawn them back to the farm. The first stop on our two-day tour of familiarizing ourselves about the work of these returning descendants was Circle Organic farm. 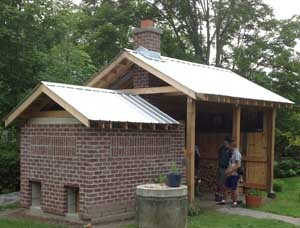 Andrew and his wife Julie returned to their native Peterborough with the intention of establishing a sustainable farm. After having taken advice from master growers in the area, they made the decision to grow as high a quality and yield of foodstuffs as possible. Andrew explained that the high expense of using natural earth nutrients was worthwhile in order to produce the best variety of vegetables now in demand by local chefs and, by extension, homemakers as well. In Andrew’s words, “In order to bring ‘food justice’, there is a need for natural, clean garden growth”. What makes the farm special is its constantly functioning four-season greenhouse that acts as an incubator for the farm. 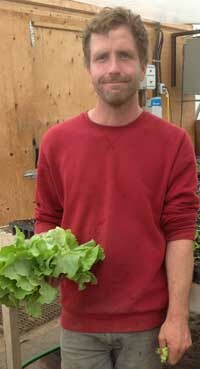 Andrew’s other goal is to create seeds for cultivar; in other words, his aim is to evolve his seeds so that they adapt to Kawartha’s climate especially for winter growth. This means a continual cycle of food and an extension of the growing season. Andrew is so in love with the land that he remarked that one must “treat soil like it’s a living being because we are what we eat”. As we left the farm, he offered us a taste of his Boston lettuce. It was truly authentic – an organic vegetable supreme. Traynor Farms was our next destination. Known for its beef production, Greg gave us a tour of his operation. It was a little sad to learn that the beautiful organic-fed calves after only three years of life will then be sent off to slaughter. Such is the cycle of life, I thought, as Greg pointed out to us the next animal to be sent to be butchered. After a short tour of the premises, a beautiful well-kept farm, we then were invited for lunch in the barn. The meal was what I would call ‘rustic farmer’s fare’ and it was good. 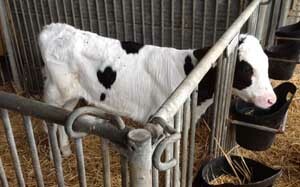 However, watching the calves as they stared at us took some of the enjoyment away from the beef on our plate. From cattle to goats, we arrived at Cross Wind Farm, a storybook-like scene of tranquil rural life except for the bleating of its 500 young goats. This family-run organic farm owned by Cindy and Kevin, produces full fat goat milk, yogurt, and artisan cheeses, all produced on the farm. The goat milk is so fresh that after the 4:30 a.m. milking, it is pasteurized in the farm’s production room, then bottled and ready for sale by 3 p.m. the same afternoon. 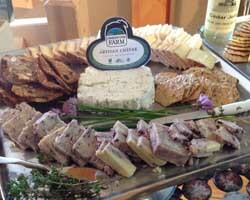 The farm’s creamy and fluffy textured cheese is available in 12 flavours, from savoury to slightly sweet. They even have a creamy Feta available in aged cheddar style and a bloomy rind crottini style cheese. 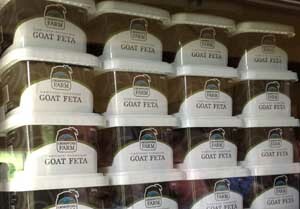 Goat yogurt is also one of their best-sellers made of 100% goat milk. Even for sale is goat meat in a variety of cuts and they also specialize in a unique tender sausage made with 100% goat. Their new product, a luxurious Goat Milk Body Butter promises to make the skin feel silky and smooth. Gratified that these animals could provide so much for the well-being of the human body, we moved on to our lodgings. Next morning, after breakfast, we entered the Kawartha County Winery and behold, before us, were dozens of shelved types of wines from red to white, dry and sweet, premium fruit wines as well as cider and even their new wild rice wine. Cooking wines such as pumpkin and others flavoured with garlic and onion and much more are offered. Imagine, right after breakfast, a wine-tasting jamboree! As we were about to purchase some of this winery’s alcoholic drinks, we walked past shelves of the winery’s own wine jellies, fruit vinegars, and preserves. It was nice to find, in the heart of Ontario’s cottage country, a general store containing the best of Ontario’s home produced wine products all available at once from the Winery’s 22 acres of farmland that produces apples, pears, raspberries, rhubarb, grapes, and maple trees. Tipsy with the exception of our guide, we boarded our van until the next stop, McLean Berry Farm. Erin greeted us at the entrance to her farm, welcoming us with enthusiasm and warmth. Her parents had started the farm in 1991 after having lived as hippies, building sailboats, picking oysters and travelling around the world. They returned to Peterborough and it was in his 40s that Erin’s father began to cultivate the 99 acres of his newly purchased farmland. Specializing in raspberries, blueberries, and strawberries, the family is hoping to soon expand into “new berries”. Not only berries, but the farm’s future will also include vegetables as their new greenhouse is the beginning of this forthcoming enterprise. The family has also just opened a nearby new location called Buckhorn Berry Farm. After lunching at the farm, we made our way through the lush countryside to the Lakefield Hard Winter Bread Company where the two enthusiastic young owners greeted us warmly. 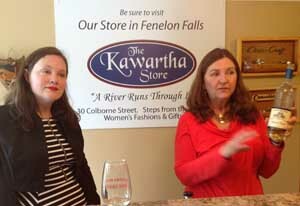 They represent the new population of Peterborough and the Kawarthas – young, hard-working, ambitious, and friendly. Their aim is to revitalize the region with new ideas and regenerate farming in the area. Jessica and Graham are very proud of their bakery but most of all, of their outdoor brick oven constructed lovingly from scratch by their own hands. After living in Smithers, BC, the couple moved back to Graham’s family farm to reclaim the heritage of home-baking practiced by his forefathers. It was the wood burner brick oven that caught our eye. Taking 6 months to build, as Graham explained, it was a labour of love. After feeding the oven with wood and burning it to just over 1000°F, as the fire burns out, the various types of bread are baked according to their necessary baking temperatures. The couple have limited time to provide a limited product and, in Graham’s words, “we work to the rhythms of the oven’s limits”. The couple produces seven types of breads each week and, depending on the season, the varieties are born. All the ingredients used are from local organic farms and every loaf they sell is fresh. These two young people make Canada proud for their passion to bring the country back home to the table. With generosity and kindness, they loaded us up with samples of their homemade products. Move over, Santa, Graham and Jessica have taken over as gift-givers. As we sat in our van feeling blessed by what we had witnessed in the revitalization of the region by young people, we drove through a tree-filled green countryside dotted with farms until we reached Peterborough. It was a beautiful landscape filled with persons who are working hard to enhance the natural wonders of Peterborough and the Kawarthas. In one of Canada’s most picturesque regions with gleaming lakes and rivers it is Maple Syrup Season!